The following analysis of the Western Washington real estate market is provided by Windermere Real Estate Chief Economist Matthew Gardner. We hope that this information may assist you with making better-informed real estate decisions. For further information about the housing market in your area, please don’t hesitate to contact me. 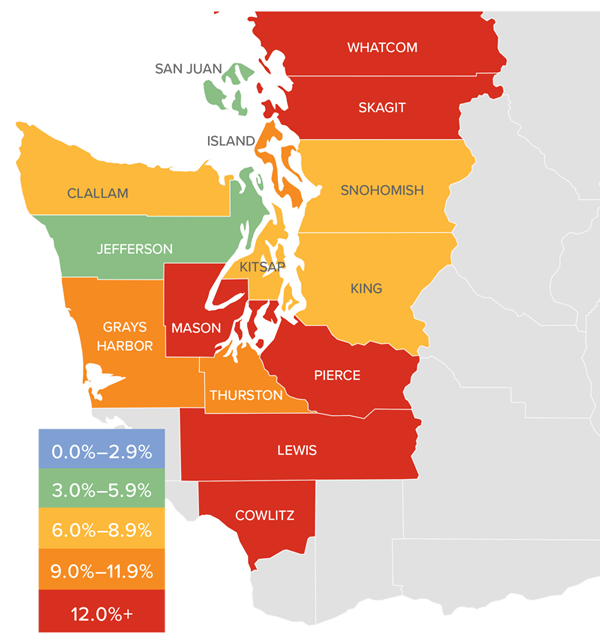 Washington State continues to be one of the fastest growing states in the nation and there is little to suggest that there will be any marked slowdown in the foreseeable future. Over the past year, the state has added 105,900 new jobs, representing an annual growth rate of 3.2%. This remains well above the national rate of 1.65%. Private sector employment gains continue to be robust, increasing at an annual rate of 3.7%. The strongest growth sectors were Construction (+7.4%), Information (+6.2%), and Professional & Business Services (+6.1%). The state’s unemployment rate was 4.5%, down from 4.8% a year ago. All year I’ve been predicting that Washington State’s annual job growth would outperform the nation as a whole, and we now know with certainty that this is going to be the case. Furthermore, I am now able to predict that statewide job growth in 2019 will be equally strong, with an expected increase of 2.6%. There were 22,310 home sales during the third quarter of 2018. This is a significant drop of 12.7% compared to the third quarter of 2017. The number of homes for sale last quarter was up 14.5% compared to the third quarter of 2017, continuing a trend that started earlier in the year. However, the increase in listings was only in Seattle’s tri-county area (King, Pierce, and Snohomish Counties) while listing activity was down across the balance of the region. Only two counties had a year-over-year increase in home sales, while the rest of Western Washington saw sales decrease. The region has reached an inflection point. With the increase in the number of homes for sale, buyers now have more choices and time to make a decision about what home to buy. As inventory levels start to rise, some of the heat has been taken off the market, which caused home prices in the Western Washington region to go up by a relatively modest 6.2% over last year to $503,039. Notably, prices are down by 4.4% when compared to the second quarter of this year. Home prices, although higher than a year ago, continue to slow due to the significant increase in the number of homes for sale. This, in my opinion, is a very good thing. When compared to the same period a year ago, price growth was strongest in Lewis County, where home prices were up 15.3%. Six other counties experienced double-digit price increases. Slowing price growth was inevitable; we simply could not sustain the increases we’ve experienced in recent years. Lower rates of appreciation will continue until wage growth catches up. The average number of days it took to sell a home dropped by four days compared to the same quarter of 2017. Across the entire region, it took an average of 39 days to sell a home in the third quarter of this year. This is down from 43 days in the third quarter of 2017 and down 2 days when compared to the second quarter of 2018. King County continues to be the tightest market in Western Washington, with homes taking an average of only 19 days to sell. Every county in the region other than Skagit and King — which both saw the time on the market rise by 2 days — saw the length of time it took to sell a home drop when compared to the same period a year ago. More choice in the market would normally suggest that the length of time it takes to sell a home should rise, but the data has yet to show that. That said, compared to last quarter, we are seeing some marked increases in days on market in several counties, which will be reflected in future reports. This speedometer reflects the state of the region’s real estate market using housing inventory, price gains, home sales, interest rates, and larger economic factors. I started to move the needle toward buyers last quarter and have moved it even further this quarter. Price growth continues to slow, but more significant is the rise in listings, which I expect to continue as we move toward the quieter winter period. I believe that psychology will start to play a part in the housing market going forward. It has been more than 15 years since we’ve experienced a “balanced” market, so many home buyers and sellers have a hard time remembering what one looks like. Concerns over price drops are overrated and the length of time it’s taking to sell a home is simply trending back to where it used to be in the early 2000s. Matthew Gardner is the Chief Economist for Windermere Real Estate, specializing in residential market analysis, commercial/industrial market analysis, financial analysis, and land use and regional economics. He is the former Principal of Gardner Economics, and has more than 30 years of professional experience both in the U.S. and U.K. It appears that balance is slowly returning to the local housing market. Home price growth slowed in September. Inventory continued to climb, but is still far short of the four to six months that indicate a normal market. Homes are staying on the market longer, giving buyers the breathing room to make the right choice for their situation. With our region’s healthy job growth, and demand still exceeding supply, it’s likely to take some time to move to a fully balanced market. Home price increases moderated into the single-digits in September. The median price of a single-family home on the Eastside was up 4 percent from the same time last year to $890,0000 but down from a median price of $935,000 in August. Inventory increased significantly and price drops jumped. While the market is softening, the recent expanded presence of Google and Facebook on the Eastside means demand should stay strong. In addition, the area’s excellent school system continues to be a large draw for buyers both locally and internationally. Inventory was up 68 percent year-over-year in King County due to a higher number of sellers listing their homes and fewer sales. There is now more than two months of inventory in the county, a number we haven’t seen in nearly four years. Despite the increase, there is a long way to go to reach the four to six months of inventory that is considered balanced. In September, the median price of a single-family home was $668,000; an increase of 7 percent from the same time last year and virtually unchanged from August. Inventory in Seattle surged in September from a year ago. Only San Jose, CA saw the number of homes for sale rise faster than Seattle last month. The median home price in September was $775,000. Up slightly from the $760,000 median price in August and a 7 percent increase from last year. The double-digit price growth of past years appear to be waning and overzealous sellers who listed their homes at unrealistically high prices have been forced to reduce them. Bidding wars have declined and the typical well-priced house is now selling right at asking price. While not nearly as dramatic as the case in King County, inventory in Snohomish County was up 40 percent. The area has just over two months of inventory with home prices moderating. The median price of a single-family home increased 8 percent over a year ago to $485,000. That’s down from the $492,000 median reached in August and $26,000 less than the peak of the market reached in spring. Getting started: Check your toolbox to make sure you have all the materials you need for home maintenance in one place. This NY Times article provides a good list of the tools you’ll really need to maintain your home. After your toolbox is put together, you can confidently begin the maintenance on your home. Insulation: Insulating a home can reduce your energy bill by up to 50%. For the best results, your home should be properly insulated from the ceilings to the basement. By starting in your attic and progressively adding insulation to other areas of your home over time, you will avoid spending a large sum of money up-front. Cracks & Leaks: Do a run-through of your entire house for cracks and leaks, from your roof to your baseboards. Winter weather is unpredictable. Whether your area gets rain, wind or snow, cracks in your house can lead to cold drafts or leaks that cause water damage. Depending on your house type, most cracks can be easily filled with supplies from your local hardware store in a do-it-yourself fashion. Use caulk to seal any cracks in the permanent building materials. Windows & Doors: Another common place for heat leakage is in your windows and exterior doorways. Make sure seals are tight and no leaks exist. If you have storm windows, make sure you put them on before the cold season begins. Don’t underestimate the difference some weatherstrips and a door sweep can provide in preventing drafts and keeping the heat in. Rain Gutters: Clean your rain gutters of any debris. In colder climates, buildup will cause gutters to freeze with ice, crack and then leak. Once you have removed the residue from the drains, test them by running hose water to make sure cracks and leaks have not already formed. Even in warmer locales, the buildup can put undue stress on your roof and home. Pipes: Pipes are a number one risk in winter climates. A burst pipe can become a winter disaster in a matter of seconds. Remember to turn off your exterior water source and take in your hose. Internally, wrapping your pipes is a recommended precaution to take. Heating System: What’s one thing gas fireplaces, wood burning stoves, and central air heating systems all have in common? They all need to be cleaned and maintained. Annual checks of are vital in avoiding dangers such as house fires. If you use an old-fashioned wood stove, make sure there are no leaks and that all soot build up or nests are removed. If a furnace is what you have, remember to change the filters as recommended or clean out your reusable filters. Fireplace & Wood burning stoves: Make sure to have chimneys and air vents cleaned early in the season if you are planning on warming your home with a wood-burning source. When your fireplace is not in use make sure to close the damper, some resources estimate an open damper can increase energy consumption by as much as 30%. Outside: As we mentioned before, make sure you bring your patio furniture inside (or cover) for the winter- but don’t forget other, smaller items such as your tools, including a hose and small planting pot. Clear out any piles around the side of your house, checking for cracks as you go so to avoid providing shelter for unwelcome guests over the cold season. If your property has large trees check for loose branches and call someone to trim back any items that may fall in your yard, on your roof or even damage a window. Emergency Kit: Lastly, make sure your emergency kit is up-to-date with provisions, batteries, fresh water, food for animals, entertainment for kids, etc- especially if you live in an area prone to power outages. The number of homes for sale in August increased dramatically over the same time a year ago. This is the result of a moderate increase in new listings and a much slower pace of sales. Homes are staying on the market longer, giving buyers more choices and more time to make an informed decision. While home prices are up compared to a year ago, the rate of increase was in the single digits rather than the double-digit surges of past months. It’s still a seller’s market, but sellers need to have realistic expectations about pricing their homes as the market softens. King County experienced yet another flood of inventory with the number of homes for sale jumping 65 percent over the previous year. Despite the growth, the county has just 1.9 months of inventory and remains a seller-oriented market. The market has slowed but it remains fast-paced, with 62 percent of the properties here selling in fewer than 15 days. While home prices were up 3 percent from a year ago, the median price of $669,000 represented the third straight month of declines from the record-high of $726,275 reached in May. The median price of a single-family home on the Eastside was up nearly 10 percent from the same time last year to $935,000. Home prices have declined each month from the all-time high of $977,759 set in June. Inventory increased 73 percent over last August. With supply soaring and home prices moderating, sellers need to work with their broker to price their home to meet the current market conditions. A year ago 47 percent of the homes on the Eastside sold for over list price. This August that number was down to 29 percent. After leading the nation in home price growth for nearly two years, Seattle is finally cooling off. The median home price in August was $760,000, up just 4 percent from last year and down from the record $830,000 reached in May. Inventory soared in August, but the city still has just two months of supply, far short of the four to six months that is considered balanced. Bidding wars are becoming less common and price drops more common. Sellers must adjust their expectations to what appears to be a long waited moderating of the market. Mirroring the market slowdown in King County, Snohomish County also experienced a cooling off in August. The median price of a single-family home was $492,000, up 8 percent from a year ago but down from the record high of $511,000 two months prior. Inventory increased nearly 30 percent, but at just 1.6 months of supply the market remains very tight and sales are brisk. Sixty percent of homes here sold within 15 days. Surprisingly, one of the biggest factors in choosing a new home isn’t the property itself, but rather the surrounding neighborhood. While new homes occasionally spring up in established communities, most are built in new developments. The settings are quite different, each with their own unique benefits. Older neighborhoods often feature tree-lined streets; larger property lots; a wide array of architectural styles; easy walking access to mass transportation, restaurants and local shops; and more established relationships among neighbors. New developments are better known for wider streets and quiet cul-de-sacs; controlled development; fewer aboveground utilities; more parks; and often newer public facilities (schools, libraries, pools, etc.). There are typically more children in newer communities, as well. Consider your daily work commute, too. While not always true, older neighborhoods tend to be closer to major employment centers, mass transportation and multiple car routes (neighborhood arterials, highways and freeways). If you like Victorian, Craftsman or Cape Cod style homes, it used to be that you would have to buy an older home from the appropriate era. But with new-home builders now offering modern takes on those classic designs, that’s no longer the case. There are even modern log homes available. Have you given much thought to your floor plans? If you have your heart set on a family room, an entertainment kitchen, a home office and walk-in closets, you’ll likely want to buy a newer home—or plan to do some heavy remodeling of an older home. Unless they’ve already been remodeled, most older homes feature more basic layouts. If you have a specific home-décor style in mind, you’ll want to take that into consideration, as well. Professional designers say it’s best if the style and era of your furnishings match the style and era of your house. But if you are willing to adapt, then the options are wide open. Homes built before material and labor costs spiked in the late 1950s have a reputation for higher-grade lumber and old-world craftsmanship (hardwood floors, old-growth timber supports, ornate siding, artistic molding, etc.). However, newer homes have the benefit of modern materials and more advanced building codes (copper or polyurethane plumbing, better insulation, double-pane windows, modern electrical wiring, earthquake/ windstorm supports, etc.). The condition of a home for sale is always a top consideration for any buyer. However, age is a factor here, as well. For example, if the exterior of a newer home needs repainting, it’s a relatively easy task to determine the cost. But if it’s a home built before the 1970s, you have to also consider the fact that the underlying paint is most likely lead0based, and that the wood siding may have rot or other structural issues that need to be addressed before it can be recoated. On the flip side, the mechanicals in older homes (lights, heating systems, sump pump, etc.) tend to be better built and last longer. One of the great things about older homes is that they usually come with mature trees and bushes already in place. Buyers of new homes may have to wait years for ornamental trees, fruit trees, roses, ferns, cacti and other long-term vegetation to fill in a yard, create shade, provide privacy, and develop into an inviting outdoor space. However, maybe you’re one of the many homeowners who prefer the wide-open, low-maintenance benefits of a lightly planted yard. Like it or not, most of us are extremely dependent on our cars for daily transportation. And here again, you’ll find a big difference between newer and older homes. Newer homes almost always feature ample off-street parking: usually a two-car garage and a wide driveway. An older home, depending on just how old it is, may not offer a garage—and if it does, there’s often only enough space for one car. For people who don’t feel comfortable leaving their car on the street, this alone can be a determining factor. While the differences between older and newer homes are striking, there’s certainly no right or wrong answer. It is a matter of personal taste, and what is available in your desired area. To quickly determine which direction your taste trends, use the information above to make va list of your most desired features, then categorize those according to the type of house in which they’re most likely to be found. The results can often be telling. This post was originally on the Windermere Blog. When making an important decision like buying a new home, personal circumstances are often a driving force. Whether you are a first-time homebuyer, need more space for your growing family, downsizing to fit an empty nest, or looking for a retirement property, finding the right information, the right real estate agent, and the right properties that fit your needs are all important parts of that process. Based on recent studies by the National Association of REALTORS®on generational trends, we can identify the best resources to help you in any phase of your life. Among all generations, the first step most buyers take when searching for a home is online. Younger generations tend to find the home they eventually purchase online, while older generations generally find the home they purchase through their real estate agent. Across generations, home ownership still represents a significant step in achieving the American Dream. According to a study by LearnVest, an online financial resource, 77 percent of those surveyed believed that buying a home of their own was, “first and foremost in achieving the American Dream”. How that dream manifests is different for those who have grown up in different eras. Also known as Generation Y or the Echo Boomers because this generation almost equals the baby boomers in population. This age group is the second largest group of recent homebuyers, representing 28 percent according to the National Association of REALTORS. 79 percent of homebuyers in this age are purchasing their first home. According to the 2012 Trulia American Dream Study, 93 percent of renters in this generation plan on purchasing a home someday. When considering a home purchase, Millennials (and some Generation X buyers) place a high value on convenience to work, affordability, and the quality of school district. This generation is the most likely to choose an urban center as the location of their first home. According to market research by Gfk Roper, this group is most interested in their home as a social hub, with a focus on entertainment and amenities. When looking for a real estate agent, Millennials are most likely to looks to friends and family for a referral. They generally place a high value on an agent’s honesty and trustworthiness because they are often relying on their agent to walk them through the home purchase process for the first time. As the largest group of recent homebuyers, the LearnVest findings suggest that 72 percent of Americans in this generation are already homeowners. They also represent the largest group of home sellers, with a substantial percentage of the group looking to upgrade their home to accommodate their growing families or increase investment. Experts in the real estate industry expect this group to lead in the recovered real estate market. Generation X households are more likely to have a dual income, with both adult members in the household working. According to a study by GfK Roper, a market research company, this generation placed state-of-the-art kitchens at the top of their priorities, as well as large closets and amenities for organization, since many Gen Xers have children living in their homes. They are less concerned about formality in their home and have less interest in formal dining and living rooms. Interestingly enough, the NAR study finds that as the age of the homebuyer increases, the age of the home being purchased declines. Baby boomers and older buyers are looking for newer construction, with less need for renovations or large maintenance issues. This generation ranks state-of-the-art kitchens, whirlpool baths, walk-in closets, and hobby spaces high on their list of must-haves, according to GfK Roper. The boomer generation is also looking to the future for both themselves and their aging parents, “fourteen percent of homebuyers over the age of 48 are looking to purchase senior-related homes, for themselves or others” according to the NAR study. Boomer parents are becoming accustomed to (or preparing for) an empty nest, so this group may be downsizing or looking for a home that specifically fits their needs. This generation of buyers places a bigger emphasis on finding a home closer to friends, family, and health facilities. While this generation uses the Internet to find their home in the early stages of a home search, they work more directly with a trusted real estate agent to find the home that specifically fits their needs. A home purchase for members of this generation will likely not be a first-time experience so they are less willing to compromise on the price, size, or condition of a home. This generation is generally more satisfied with the homebuying and selling process because they have been through it before and know what to expect. According to the Trulia American Dream study, this group is also most likely to have realistic assumptions about the cost of a home and mortgage. This was originally posted on the Windermere Blog. For the first time in years, the real estate market is finally starting to deliver good news for buyers. The region experienced its third straight month of significant growth in inventory. Homes are sitting on the market longer, prices are moderating, and multiple offers are becoming more rare. Despite the surge in homes for sale, it is still a seller’s market. Inventory would need to triple to reach what is considered a balanced market. Inventory on the Eastside soared 47 percent over the same time last year. There was a slight increase in new listings, but the jump was mostly due to homes staying on the market longer. Price drops have become more common. With buyers having more choices, sellers need to work with their broker to make sure they price their home correctly the first time. After setting a new high of $977,759 in June, the median price of a single-family home dropped to $947,500 in July. While offering some hope that prices may have started to moderate, the median is still 10 percent higher than it was the same time a year ago. King County saw the biggest increase in inventory in a decade, with the number of homes for sale jumping 48 percent over a year ago. However, at 1.5 months of supply that’s still well below the 4-6 months of inventory that is considered balanced. The median price of a single-family sold in July was $699,000. That represents an increase of 6 percent from a year ago, but is down 4 percent from the record high of $725,000 set in April. Perceptions that the market is cooling needs to be kept in perspective. Homes here took an average of 15 days to sell. Seattle saw inventory shoot up 60 percent over a year ago, bringing the supply to its highest level in over three years. Even with the sharp increase, much more inventory is needed to meet the demand for homes in the city and sellers may well decide to jump into the market. According to a Zillow study, more than 97 percent of homes in Seattle are worth more now than the peak level before the housing market crashed. Median home prices are 29 percent above the bubble peak level with the median price in July landing at $805,000; up 7 percent from last July and down from the record $830,000 reached in May. Snohomish County also had double-digit increases in inventory, though not nearly as great as King County. The number of homes for sale in July increased nearly 16 percent over the same time a year ago, but inventory continues to be very tight. The median price of a single-family home rose 9 percent year-to-year to $495,000. That figure is down from the record high of $511,500 set in June. A move towards a more moderated market is encouraging for buyers and an incentive for sellers to list their homes soon. The following analysis of the Western Washington real estate market is provided by Windermere Real Estate Chief Economist Matthew Gardner. We hope that this information may assist you with making better-informed real estate decisions. The Washington State economy added 83,900 new jobs over the past 12 months, representing an annual growth rate of 2.5%. This is a slowdown from the last quarter, but employment growth remains well above the national rate of 1.6%. Employment gains continue to be robust in the private sector, which was up by 2.8%. The public sector (government) grew by a more modest 1.1%. The strongest growth sectors were Retail Trade and Construction, which both rose by 4.8%. Significant growth was also seen in the Education & Health Services and Information sectors, which rose by 3.9% and 3.4%, respectively. The State’s unemployment rate was 4.7%, down from 4.8% a year ago. Washington State will continue adding jobs for the balance of the year and I anticipate total job growth for 2018 will be around 80,000, representing a total employment growth rate of 2.4%. There were 23,209 home sales during the second quarter of 2018. This is a drop of 2.3% compared to the same period a year ago. Clallam County saw sales rise the fastest relative to the same period a year ago, with an increase of 12.6%. Jefferson County also saw significant gains in sales at 11.1%. The number of homes for sale last quarter was down by a nominal 0.3% when compared to the second quarter of 2017, but up by 66% when compared to the first quarter of this year. Much has been mentioned regarding the growth in listings, but it was not region-wide. King County saw a massive 31.7% increase in inventory, though all but three of the other counties covered in this report saw the number of listings drop compared to a year ago. The takeaway from this data is that while some counties are seeing growth in listings — which will translate into sales down the road — the market is still out of balance. As inventory is still fairly scarce, growth in home prices continues to trend well above the long-term average. Prices in Western Washington rose 12.2% over last year to $526,398. Home prices continue to trend higher across Western Washington, but the pace of growth has started to slow. This should please would-be buyers. The spring market came late but inventory growth in the expensive King County market will give buyers more choices and likely lead to a slowing down of price growth as bidding wars continue to taper. When compared to the same period a year ago, price growth was strongest in Mason County, which was up 17.4%. 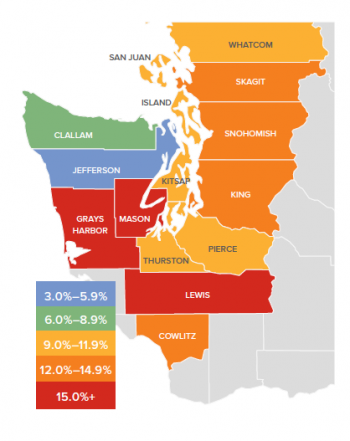 Eleven other counties experienced double-digit price growth. Mortgage rates, which had been rising significantly since the start of the year, have levelled off over the past month. I believe rising rates are likely the reason that inventory levels are rising, as would-be sellers believe that this could be the right time to cash out. That said, the slowing in rate increases has led buyers to believe that rates will not jump soon, which gives them a little more breathing room. I do not expect to see any possible slowdown in demand until mortgage rates breach the 5% mark. The average number of days it took to sell a home dropped by seven days compared to the same quarter of 2017. King County continues to be the tightest market in Western Washington, with homes taking an average of only 13 days to sell. Every county in the region other than Clallam saw the length of time it took to sell a home drop when compared to the same period a year ago. Across the entire region, it took an average of 41 days to sell a home in the second quarter of this year. This is down from 48 days in the second quarter of 2017 and down by 20 days when compared to the first quarter of 2018. Although we did see some inventory increases when compared to the first quarter of the year, we are essentially at the same level of homes on the market as a year ago. The market has yet to reach equilibrium and I certainly do not expect to reach that point until sometime in 2019. This speedometer reflects the state of the region’s real estate market using housing inventory, price gains, home sales, interest rates, and larger economic factors. For the second quarter of 2018, I have moved the needle very slightly towards buyers, but it remains firmly a seller’s market. This shift is a function of price growth tapering very slightly, as well as the expectation that we should see more homes come on the market as we move through the balance of the year. The local real estate market looks like it might finally be showing signs of softening, with inventory up and sales down. More sellers have opted to put their homes on the market. Inventory was up 47 percent in King County and price increases were in the single digits. Despite the increase in inventory and slowdown in sales, it’s still a solid seller’s market. Over half the properties purchased in June sold for more than list price. The number of homes on the market in King County soared 47 percent from a year ago, the biggest increase since the housing bubble burst. Despite the increase, there is just over one month of available inventory, far short of the four to six months that is considered a balanced market. The median price of a single-family home increased 9 percent over last June to $715,000. That’s down 2 percent from the $726,275 median in May. Home prices haven’t dropped from May to June in King County since the last recession. A booming economy offered little price relief for buyers looking on the Eastside. In a recent study of economic strength by state, Washington ranked number one in the country. An additional report targeting cities ranks the Seattle-Bellevue-Tacoma market as the nation’s fourth strongest economy. The median price of a single-family home on the Eastside rose 10 percent over a year ago to $977,759 setting another record. There is some good news for buyers. Inventory rose to its highest level in three years, with the number of homes for sale increasing 46 percent from the same time last year. Seattle trails only Bay Area cities when it comes to greatest profits for home sellers. That may help explain the surge in inventory in June. For example, the number of homes for sale in the popular Ballard/Green Lake area doubled from a year ago. Even though buyers are finally getting more choices, demand still exceeds supply. Homes sell faster in Seattle than in any other U.S. real estate market. That demand propelled the median price of a single-family home to $812,500; up 8 percent over last June and down from the record $830,000 set in May. The largest jump in home prices in the region came in Snohomish County. While higher-priced markets in King County are seeing increases slowing slightly, the median price of a single-family home here jumped 14 percent to $511,500, a new high for the county. Buyers willing to “keep driving until they can afford it” are finding Snohomish County an appealing destination. On Friday, June 8th our Windermere offices closed their doors for our annual Community Service Day. Since 1984, Windermere has dedicated a day to giving back to the community and assisting with neighborhood improvement initiatives. The Bellevue and Bellevue West offices teamed up to lend a hand at Jubilee REACH. This local organization supports the social and emotional needs of children and their families through mentoring, tutoring, and after-school clubs and sports programs within Bellevue public schools. Our Windermere team helped with a variety of maintenance tasks including painting doors and benches, landscaping, replacing lights, washing windows, repainting the basketball court, pressure washing walkways and play sets, and more. We are proud of our offices’ hard work at this site, and we are grateful to Jubilee REACH for their important contributions to our community and for letting us be a part of their mission! See more photos of the day here. Our Redmond office assisted Bellevue-based Kids Without Borders, an organization founded by Son Michael Pham, who used his experience as a refugee from Vietnam as a catalyst to serve children in our local and international communities with the vision of “all kids, one world.” Agents and staff spent the day with Son Michael Pham at the KWB storage units where they sorted and packed clothing for distribution to families in need. This was a great opportunity for us to return some of the generosity this organization has put into our global community! 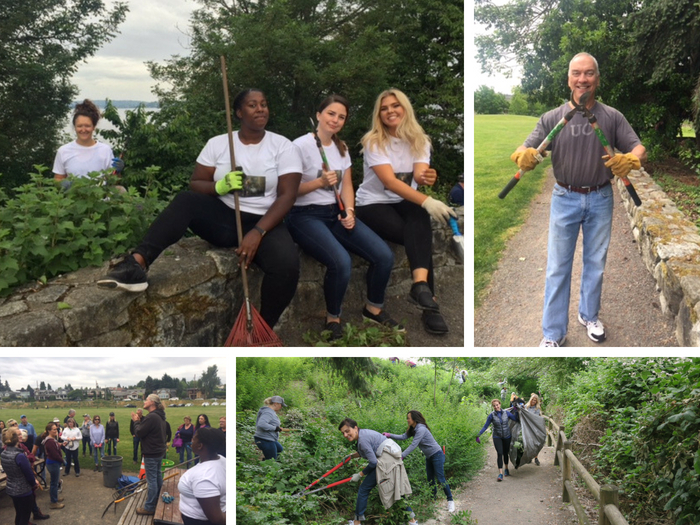 Yarrow Bay agents and staff rolled up their sleeves, slipped on their gardening gloves, and grabbed shears and rakes to landscape and remove invasive plants at Heritage Park near downtown Kirkland. The park offered an incredible view of the Seattle skyline across Lake Washington as they worked – a reminder of how lucky we are to be able to enjoy the serenity of nature while still being close to the bustling city. We were happy to do our part to beautify and help preserve part of what makes our community so special! Our Bellevue South office gave back by partnering with Seattle Children’s Odessa Brown Children’s Clinic, which strives to promote quality pediatric care, family advocacy, health collaboration, mentoring, and education in a culturally relevant context. Our agents and staff helped with landscaping and mulching the clinic grounds, facilitating the book drive, and working on art projects with kids at the clinic. As an added bonus, they had the chance to listen to talks by a pediatrician and Lenny Wilkens, former NBA player and coach and current children’s healthcare advocate. We are thankful to OBCC for welcoming and inspiring us on Community Service Day and every day! Our Issaquah office headed to the Cougar Mountain Zoo in Issaquah to help with their mission to increase the understanding and appreciation of the Earth’s wildlife and the role of humanity in nature through education, conservation, propagation, and exhibition – and enjoy the company of some of its animal inhabitants. A few of their projects included clearing brush, painting benches, and habitat maintenance/wall building. This was one of the Issaquah office’s favorite Community Service Day projects, and we loved seeing them experience the zoo in a whole new way that reminded us of all of the work that goes into maintaining these neighborhood treasures! Community Service Day has always been a treasured tradition and an important part of our culture here at Windermere. We greatly appreciate everything our agents invest in our communities to make them even better. Thank you all for continuing to make this a place we are proud to call HOME.